Currency Converter + is a free Windows 8 currency converter app available under ‘Finance’ section of its app store. 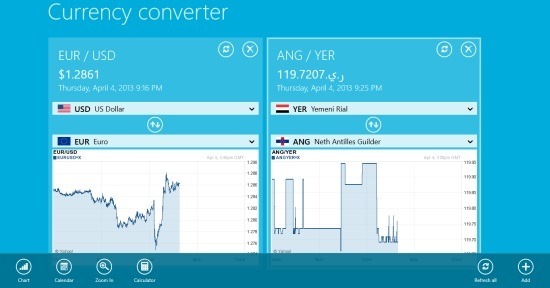 This currency converter app for Windows 8 lets you convert currency of one country to another. It supports nearly 150 monetary units and major precious metals. You can easily get the current rate, as well as view the history of exchange rates in the form of graph. There are three different types of charts available including Bar, Line, and Candle. You can also view calendar, use calculator, and add as many graphs as you want. The rate keeps on shuffling automatically and it displays you the current rate, and current graph. As you right-click anywhere on the screen, you will find a horizontal bar at the bottom of the screen including options such as Chart, Calendar, Zoom In, Calculator, Refresh All, and Add. Let me quickly point out the main features of this Windows 8 currency converter app below. Lets you convert currency of one country to another. Lets you view the history of exchange rates in the form of graph. There are three types of charts including Bar, Line, and Candle. Comes with calendar, calculator, refresh options. Lets you add as many graphs as you want. Well.. it’s a good utility currency converter Windows 8 app to convert currencies between two different countries. The interface is also very beautiful. All the information has been given very systematically. Also, check out our posts on Currency Converter Apps, Travel Guide Apps, and App to Book Hotels. You need to head over to the Windows 8 app store and look for ‘Currency Converter +’. Now, you will find ‘Install’ button, clicking on which will start installing the app in your Windows 8 system. Soon, you will find a notification at the top right-side of the screen. Start using the app. In short, Currency Converter + is extremely useful if you are travelling to a different country or are planning to buy or sell products from or to a different country. Go ahead and download Currency Converter + app in Windows 8 now.